WORLD'S LARGEST METAPHOR HITS ICEBERG . . . . The Titanic may not have completed her only voyage, but she has sailed memorably on ever since as a metaphor for politics, religion, catastrophe, hubris and any other folly known to mankind. The world over, her meaning seems instantly recognizable; a truly global metaphor which needs no further explanation. Her use as a metaphor for avoidable catastrophe can be verbal, merely by describing a situation as 'Titanic', although that often just means very large. Its most interesting use is in the cartoon, where it often represents a juggernaut of political stupidity or corruption. She has been used, among many others, by cartoonists in the Third Reich, and by those infuriated by Margaret Thatcher in Britain. The Titanic symbolism is also closely related to her physical power, although in the early part of the 20th Century much of that was associated with the prevailing social conditions, and that particular imagery has declined since. However, as a metaphor she has almost inexplicably survived the years. As the sinking is probably the cultural metaphorical icon of our times, it is worth wondering why this distinction should have befallen the Titanic. The 20th Century world was no stranger to disaster either before or after the sinking. Sometimes, commentators argue that this was the first major catastrophe which challenged man's complacent mastery over nature in the emerging era of modernism. But this is not so. Only ten years before, a volcano on the island of Martinique erupted without warning, instantly engulfing the town of St. Pierre in a pyroclastic cloud of vaporizing gases and debris, devastating the liner Roraima in the harbour, and killing an unconfirmed total of up to 40,000 men, women and children. At the time people, especially in America, were shocked and horrified, and the event was headlined for days. This disaster, so redolent of Sodom and Gomorrah or Pompeii, and of an Almighty destroying the innocents in order to cull the wicked, might well have become an enduring religious metaphor, if nothing else. Possibly, such an Old Testament interpretation of the event might have seemed anachronistic in the brave new technological century, in which non-deists were increasing in the arts and the media. It could, however, have become a metaphorical warning against science taking our world for granted, and the almost eternal patience of an apparently dormant force of nature. But it did not become a metaphor at all. Only two years after the Titanic disaster, the Empress of Ireland sank in 1914 in the St. Lawrence river with a similar loss of passenger life, in equally frigid conditions, and far faster. It has often been argued that this tragedy was eclipsed by the outbreak of WW1. However, the Great War was not an unforeseen event and, despite the loss of an estimated 15 million people  , never became a metaphor in itself, even though it generally has an iconic status as the most wasteful war ever fought in terms of human lives, and one in which the moral purpose of the conflict now seems distressingly obscure. So what makes the Titanic disaster so different? Some commentators point to the number of celebrities on board as the reason for the ship's metaphorical status. Like now, the celebrities of the day were very rich except, then, the rich tended to be rather more Establishment, and only from the cream of society. There was less regard in 1912 for sportsmen, fashion designers, musicians, artists, actors, or media personalities. The Titanic actually carried candidates for most of those categories, but they were not the ones who grabbed the major headlines after the sinking, whether they survived or not. Any subsequent fame of such people was a rather secondary post-sinking phenomenon and, although seemingly an exception, Lady Duff Gordon was of interest first as an aristocrat, and only secondly as Lucile. The really important people, in the public eye, were the Cardezas, the Guggenheims, the Widenders, the Thayers, the Astors, and their ilk, which explains why Astor hogged the headlines in New York in April 1912. He allegedly made this remark before 1912 to some amusement but not to outrage, which suggests that the ordinary people in those pre-war days were relatively immune to the idea that they were as much deserving of the fruits of capitalism as were the rich. 'Class distinction was often rationalized as both a reflection of superior ability and talent - a kind of social Darwinism - and a necessary, even helpful component in fuelling economic development and prosperity. Wealth was perceived as an entitlement of economic activity, diligence and other moral attributes, and religiosity'. However, the fact that the quotation survives to this day suggests that some influential people, at least, found it a somewhat odd comment, both socially and economically, and that the metaphor endures. The Empress of Ireland carried no notable American millionaires, and the first and second cabin passengers were mostly from countries in the British Empire, suggesting that they were probably either departing Canadian citizens or Empire functionaries and their families. Neither of these categories was either glamorous or interesting, so the lack of 'names', rather than the closeness of the disaster to outbreak of WW1, may be the main reason it made relatively little impact. 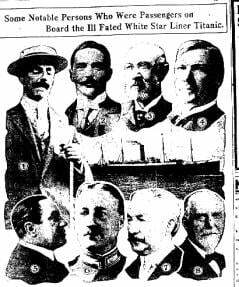 On the Titanic, the loss of so many celebrities at once may explain the intense media and public interest at the time but it certainly does not, however, explain the Titanic's power as a metaphor. To be really trenchant a metaphor must have both imagery and relevance and, very frequently, irony. The deaths of human beings, no matter how admired they were, are both commonplace and inevitable. The sheer size of the Titanic could possibly contribute to her metaphorical power. However, she was not the first ship of her size and she would soon have been exceeded by a German liner. Her size does explain the contemporary apparent belief that she was unsinkable though, which does lend a strong irony to her fate, illustrating so well the human folly of hubris. The loss of anything considered state-of-the-art is always a shock. Concorde crashed near Paris in 2000 creating far more fascination and concern than something as comparatively mundane as any other airliner coming down, and many believe this event contributed to its withdrawal from service in 2003, despite an otherwise impeccable 25-year operating record, and the demonstrable fact that the real reason was economic. Concorde could also, given its status, have been loaded with celebrities when it crashed, although as it happens it wasn't. Although Concorde has appeared in cartoons, it is probably unlikely to do so in the future, which suggests it lacks real metaphorical power. It has imagery, but not irony, because nobody ever suggested it could not crash. So it cannot represent hubris or arrogance, but merely human error, which is always only to be expected anyway. The Titanic differs from Concorde in one other important respect; she was brand new, and on her maiden voyage. This gives the Titanic a uniqueness and poignancy which contributes powerfully to her imagery. It lends the event an incredibility which is almost supernatural, an aspect which was vigorously deployed from pulpits all over Britain and America immediately. Away from the sophisticated and secular media, it was seen as a powerful image and metaphor. But this seems unlikely to have contributed much to her enduring metaphorical power, especially as society became more secular as the 20th century progressed, and even the most religious today are not very likely to give much credence to the hand of God in the matter. Most of the other imagery connected to the Titanic is simply fascinatingly tragic, whether true or mythical. The lack of boats, the slow stately sinking, the escaping owner, the desperation of the 3rd class passengers caught like rats in a trap, the heroic musicians and engineers, the unnoticed radio messages, gunshots, ships that stood still in the night, the old Captain and a megaphone - these are diffuse but interlocking images which can account for the whole lasting industry of Titanic research and storytelling. Whether or not they account for metaphorical power is, however, debatable as they are too diffuse to provide a central focus for the irony of hubris, pathos and arrogance, although a simile has endured from the tragedy - likening futile human activity to re-arranging the deckchairs on the Titanic. Which leaves only the iceberg. Like Mount Pelee, the iceberg was a natural phenomenon. 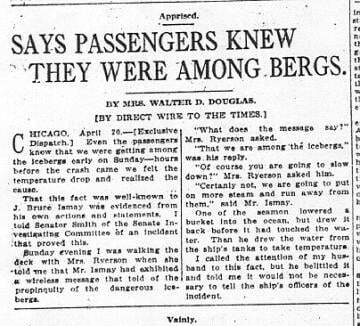 The passengers on the Titanic do not seem to have been much more worried about approaching ice than the people of St. Pierre were about their 'dormant' volcano - at least, not until imbued with the wisdom of hindsight, or assisted by imaginative reporters. One difference, however, is that the volcano was an active villain, whereas the iceberg was a passive one. It just floated there waiting for us to crash into it. Curiously, it is this small fact that seems to lend the greatest enduring metaphorical power to the disaster. Since the self-proclaimed great and the good are always running headlong into obstacles they should have known perfectly well were there, it is widely applicable and widely appreciated whenever invoked. The passivity of the iceberg provides the focus for the irony and hubris. 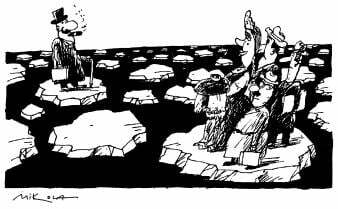 That the iceberg can also be sculpted into any shape or caricature by the cartoonist, and provides good scope for being labelled, merely adds to its appeal.